While its namemight lead you to think that National Park Cayambe-Coca protects just the snowcapped volcano Cayambe and the head waters of Coca River, but in reality, this is should be thought of as the national park of water. 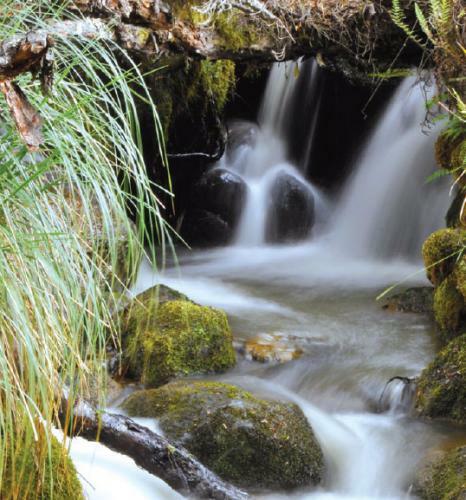 There is water everywhere, in the atmosphere because of the constant fog and rain, in the vegetation and the leaf litter, in the wetlands and lagoons of the high areas, in the soil and moorland patches, in the rivers that form waterfalls and cascades. In the higher areas there are famous hot and mineral water springs such as Papallacta and Oyacachi. In this region are the head waters of several rivers sucha as de Due, Chingual, Cofanes, and Cebeno that feed Aguarico, that together with Coca feed into the great Napo River. On the other side, towards western foothills, lies the home of thousands of springs that feed the Mira and Esmeraldas Rivers that flow in the Pacific Ocean. To Refuge Cayambe. You take the second order road Juan Montalvo- El Hato- PieMonte that leads to the refuge. Takes about 45 minutes to the checkpoint through a road that demands the use of a 4x4 vehicle in certain seasons. To Oyacachi. You take the road that leads to the Cangahua area. From here you travel 40 kilometers on an unsealed road until you reach the checkpoint. After 15 minutes you´ll find the town of Oyacachi. Baños Area. In Papallacta, next to the hot springs area, you take an unsealed road (5 km) that leads to the checkpoint and access to the trails. San Rafael Waterfall. From the town of El Chaco to the entrance of the waterfall there is a distance of 50 kilometers, the closest town before arriving is San Luis. High Areas. Rocafuerte Ave. and Puerto Baquerizo. MAGAP building, 3th floor. Cayambe - Pichincha province. Phone (02) 211-0370. Lower Areas. Calle Quito Ave. and la Revolución s/n, next to Police Deparment , La Revolución neighborhood. El Chaco. Napo province. Phone: (06) 232-9743 / (06) 232-0184. Lower Area. (06) 232-9743 / (06) 232-0184. 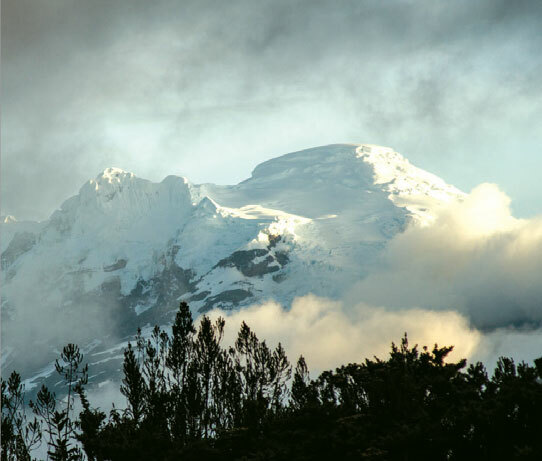 Within the park, together with Cayambe there are other important elevations such as Saraurco (height of 4,725 m) and Cerro Puntas (height of 4,425 m), the latter formed by 48 immense rocky 'teeth' that give it a unique aspect. In the lower area of the park we find El Reventador volcano. Additionally the park has a system of 80 glacier lagoons, fed by the melting of the Cayambe ice. This complex was declared a worldwide important wetland or Ramsar site. The Papallacta lagoon is very accessible from the Via Interoceanica (via Quito-Papallacta), as well as the San Marcos lagoon on the Ayora-Olmedo route, which you can get to by way of an unsealed road. Ruales Oleas Refuge: It is found in National Park Cayambe Coca and was constructed by MINTUR in 1982 before the area´s declaration as protected area and readjusted in 1994 by the Club de Ascencionismo del Colegio San Gabriel (Ascencionism Club of San Gabriel High School). In year 2012 MINTUR transferred property owning rights to MAE who remodeled it in the year 2014. Works included: installation of thermal insulation on the walls, ceilings and floors, some walls were taken down to extend the dining and housing space, the sanitary installations were remodeled along with the kitchen. The project is finished and is lending services through a cooperation agreement. Investment amount: $134,685.10 USD. Access to a clean facility, with feeding supply according to ascending activities. Facilities with added value for lodging as part of the adaptation process prior to the coronation of the volcanoes. Facilities with feeding supply for day visitors, that go to see the glacier and snow. Complementary services include the sale of artisan crafts. Integration to communities linked to the reserve in the value chain. Zona alta Agua y Vida (Highlands, Water and life). This is a trail of 7 kilometers from the área of Guamani to the área of Baños. 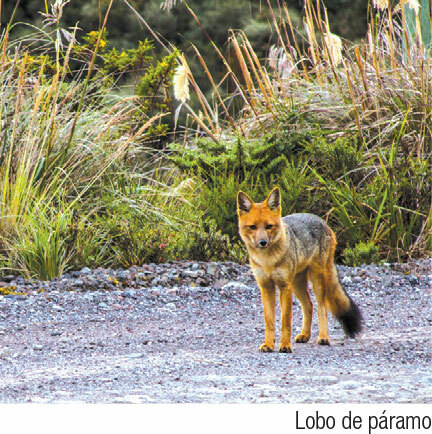 This trail allows you to get to know the Paracocha, Anteojos, and Baños lagoons. Here you can camp and do sport fishing. Medium difficulty trail. A tour guide is required for this trail. Del Oso (Bear Trail). 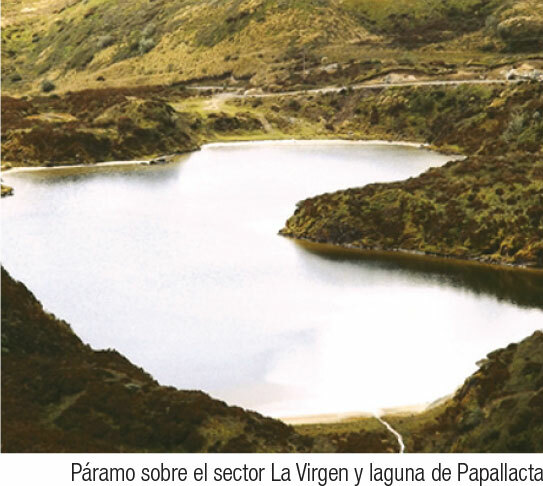 It starts in the area of the Virgen and arrives to the areo of Baños, a trail of 7.5 kilometers of medium difficulty. Here you´ll be able to camp and do sport fishing, as well as getting to know the Sucus and Mentala lagoons. A tour guide is required for this trail. Cascada Milagrosa (Miraculous Waterfall). 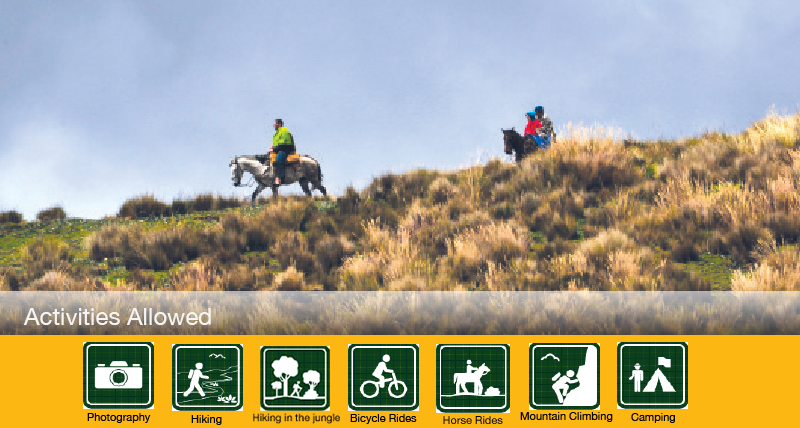 From the checkpoint Baños, you take a circuit of low difficulty with a length of 1 kilometer. Low area, T´saiki Nae´m trail (to the San Rafale Waterfall). From the entrance of the trail to the mirador at San Rafael Waterfall there is a distance of 1.5 kilometers. It takes approximately 20 minutes to come down and 25 to go up. Camping is not permitted at this site. In this park, visitors will have the privilege of traveling through some of the highest areas of the western mountain range to the Amazonic plains and get to know the diverse mestiza and indigenous populations of the Highlands and the Amazonia. Toward the Andean valleys we find the traditional cities of Cayambe, Olmedo parroquia. This area was inhabited by the Kayambis and Karankis, and to this day there are pre-inca festivities such as the IntiRaymi, to celebrate the summer solstice. On a side of the park towards the eastern side there are important cities at the foothills such as Baeza, El Chaco and Lubaqui. This was the route taken by the Spaniards on their quest for El Dorado, and on their descent they founded Baeza in 1559. Today ancient Baeza is recognized by its beautiful wooden houses adorned with flowers, it has been declared a National Heritage Site. 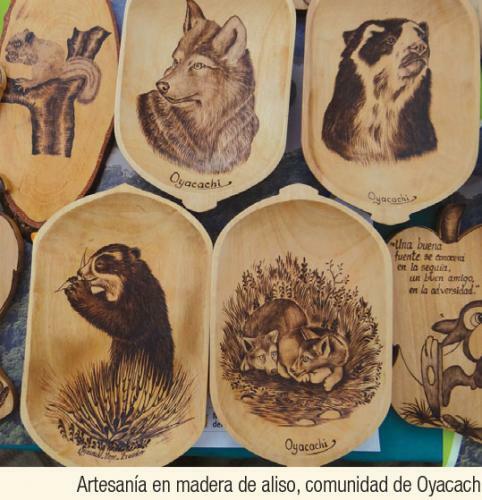 In the middle of the park there is the town of Oyacachi, a kichwa community famous for its alder wood artisan crafts and also because they now receive thousands of people every year into their hot springs. This indigenous community is the one that originally saw a virgin apparition inside a cave that was later sculpted in wood. Eventually it was moved from Oyacachi and today it is the famous Virgen de El Quinche (El Quinche´s Virgin). The park is home to 100 endemic plant species, 200 mammal species, 900 species of birds, 140 of reptiles, and 116 of amphibians distributed throughout its ecosystems. In the great plains of the moorlands close to the lagoons or where the grass mixes with fur-coated shrubbery coatedso as to endure the cold, you can see stag-goats and bunnies jumping through the grass, or watch the curiquingue and the moorland quail slowly making its way through the grasslands. We can also see Andean chucuri and weasels sliding through the vegetation, as well as some moorland mice, one of which is aquatic. Among the bigger animals we find white-tailed deer, spectacled bear, and the mountain tapir. 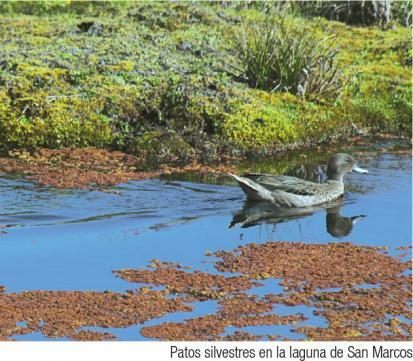 In the sky you´ll be able to see hawks, curiquingues and Andean condors, and on the lagoons we find seagulls and ducks. As night falls, moorland wolves and skunks start to appear. The paper-wood forests or yagual that intertwine together and almost leave no space to walk are mixed with patches of plants such as Tortuga, anchicoria, chuquiragua, romerillo, licopodio, and achupalla. As you descend, you´ll find the Andean forest in all its glory, with trees such as pumanquis, colcas, suros, olivos, cedros, guabos, and alder, which are covered in various mosses and ferns. There are also great dendritic ferns. Andean tucan, wild turkey and quetzal live within these forests. Close to the waterfalls, on the rocky slopes, crag roosters nest, very colorful animals that have a red crest that during early mornings and evening preform a mating dance accompanied by loud squawks. In between the river's rocks there are ducks and white headed water blackbirds. In the lower area of the park, you´ll see macaws, parrots, tucans, king vultures, pacas, agoutis, tapirs, cuchuchos, matte heads, cusumbos and a variety of monkeys such as chichicos, night, spider and howler monkeys. There are also amazing flowers; platanillos, heliconias, and anthuriums, as well as palms such as chabira, chonta, and palmetto. Here the trees become higher, with larger leaves and the temperature rises, announcing the entrance to the Amazon. The highest point in Ecuador where the equator line passes through and one of the favorite mountains for climbers. On your way to the summit you´ll be able to appreciate the beauty of its sheer terrain, the ice lagoon formations, as well as condors, which make this site particularly attractive. It´s a magic place where you can appreciate the beauty and power of nature. The waterfall is 160 meters high, falling from the Alto Coca River, which is born in the confluences of the Quijos and Salado Rivers. It is Ecuador´s largest waterfall. The most famous are the ones of the Oyacachi community and those of the Papallacta area. The hot springs reach a temperature of 60 ºC (140 ºF) thanks to volcanic activity of Antisana and El Reventador, they also have many minerals with healing properties. This is one of the most active volcanoes in the eastern mountain range. It is known for its violent eruptions that expel a great quantity of ash, hot rocks and lava. Its slopes are still covered with ash from its last eruptive explosion that was in 2002, and little by little, vegetation starts to grow on top of it. High areas: warm clothes, water poncho or a water resistang sweater in case of rain or drizzling. Appropiate shoes, walking boots in case of long or medium hikes. Lower areas: light clothing and comfortable shoes to walk the trails of the area.